Important: To start receiving the Bluetooth directives, you need to declare support for this interface using the Capabilities API. The Bluetooth interface exposes directives and events that are used to manage a client's Bluetooth connection with peer devices, such as smart phones, and Bluetooth-enabled speakers. The interface supports the following profiles: A2DP sink and source, and AVRCP target and controller. A2DP source - Originates content, such as streaming audio. A2DP sink - Receives content, such as streaming audio. AVRCP controller and target - Controls media playback on remote devices. Typically, this profiles is used with A2DP profiles for next, previous, pause, and play controls. Additionally, this interface exposes directives and events that are used to control media playback on connected Bluetooth A2DP source devices (see Media Control via Bluetooth for a complete list of directives and events.). Scan, pair, and unpair Bluetooth devices via the Amazon Alexa App. Connect and disconnect Bluetooth devices with voice and via the Amazon Alexa App. Control media playback when a connected Bluetooth device is set as A2DP source. 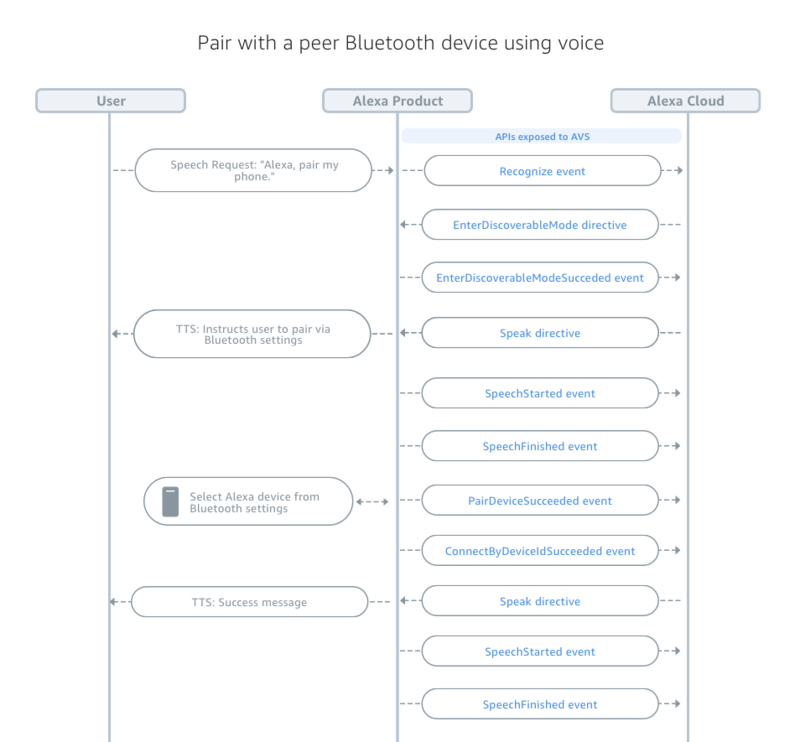 The Bluetooth interface supports scanning, connecting/disconnecting, and pairing/unpairing from Bluetooth peer devices using voice, on-product GUI, the Amazon Alexa App, and third-party companion apps. These sequence diagrams illustrate supported Bluetooth interactions, and the associated directives and events exchanged between your client and AVS. This set of sequence diagrams illustrate interactions initiated via voice. To use version 1.0 of the Bluetooth interface, it must be declared in your call to the Capabilities API. For additional details, see Capabilities API. Context is a container used to communicate the state of your client components to AVS. Context should reflect the state of client components just before an event is fired. All events that require context must include an object for Bluetooth.BluetoothState if Bluetooth is enabled. Important: A paired Bluetooth device must only be advertised as an activeDevice if currently connected. A device is not active if paired but not connected. If the device is not connected, the activeDevice object must be excluded from the context. // profile that the device supports. // that supports three profiles. // included in the pairedDevices list. // that supports two profiles. // the list of pairedDevices. // This is the streaming state at the time an event is sent. INACTIVE This is the initial streaming state of an activeDevice after it has been connected, but before any content has been streamed. ACTIVE This is the streaming state of an activeDevice that is playing audio to/from a connected Bluetooth device. PAUSED This is the streaming state when audio playback to/from a connected Bluetooth device is paused as a result of a user interaction. For example, a button press. 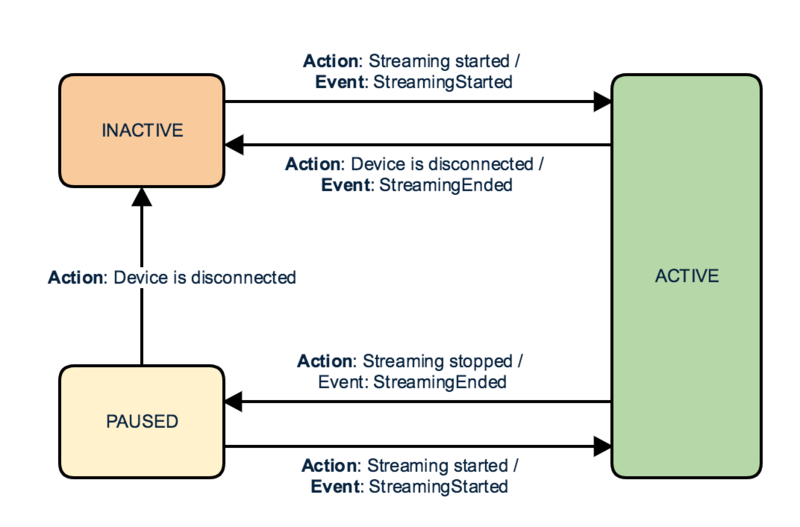 These directives and events are used to manage a Bluetooth connection between an Alexa-enabled product and peer Bluetooth devices. This directive instructs a client to scan for discoverable Bluetooth devices. Your client must send a ScanDevicesUpdated each time Bluetooth devices are discovered. If the scan fails, your client must send the ScanDevicesFailed event to AVS. Note: Scan can only be initiated via the Amazon Alexa App or on-product GUI controls. Voice initiated scanning is not supported. After receiving a ScanDevices directive, this event must be sent periodically as Bluetooth devices are discovered. discoveredDevices must contain an object for all discovered device from when the scan was initiated (not the delta from the previous event). This event requires the client to send the status of all client component states to Alexa. For additional information see Context. After receiving a ScanDevices directive, this event must be sent if the scan operation fails. If the scan fails, the list of discovered Bluetooth devices in the companion app will be cleared. Note: A scan failure is indepedent of devices being discovered. Most often, this a failure is the result of: a low-level protocol issue, driver issues, or being in an incompatible state when the scan is initiated. An empty payload is sent. This directive instructs a client to enter discoverable mode, which allows a user to initiate Bluetooth pairing from a peer device, such as a smart phone. When your client successfully enters discoverable mode, the EnterDiscoverableModeSucceeded event must be sent to AVS. If your client fails to enter "discoverable" mode, it must send EnterDiscoverableModeFailed. This event must be sent when your client enters discoverable mode. This event must be sent when your client fails to enter discoverable mode. Note: This may occur as the result of a low-level protocol or driver issue. This directive instructs a client to exit discoverable mode. For example, if a user cancels Bluetooth pairing from the Amazon Alexa App, this directive is sent from the service to your client. This directive instructs a client to initiate pairing with a specific Bluetooth device. The uniqueDeviceId should be used to maintain a local mapping with the peer device's MAC address. When a client successfully pairs with the specified device, the PairDeviceSucceeded event must be sent. If your client fails to pair with the specified device, it must send PairDeviceFailed. This event must be sent when a client successfully pairs with a peer Bluetooth device. This event must be sent when a client fails to pair with a peer Bluetooth device. This directive instructs a client to unpair from a specific Bluetooth device. When a client successfully unpairs with the specified Bluetooth device, the UnpairDeviceSucceeded event must be sent. If the client fails to unpair with the specified Bluetooth device, it must send UnpairDeviceFailed. This event must be sent when a client unpairs with a Bluetooth device. This event must be sent when a client fails to unpair with a Bluetooth device. This directive instructs a client to establish a connection with a paired Bluetooth device using that device's uniqueDeviceId. When a client successfully establishes a connection with the specified device, the ConnectByDeviceIdSucceeded event must be sent. If the client fails to establish a connection with the specified device, it must send ConnectByDeviceIdFailed. This event must be sent when a client establishes a connection with a paired Bluetooth device using uniqueDeviceId. This event must be sent when the attempt to connect to a paired Bluetooth device using uniqueDeviceId fails. This directive instructs a client to establish a connection with a paired Bluetooth device using profile information from the peer Bluetooth device. If multiple devices share the specified profile, the client should establish a connection with the last device to establish a connection. When a user says, "Alexa, pair my phone" the profile is A2DP-SOURCE, since the phone acts as SOURCE. When a user says "Alexa, pair my speaker" the profile is A2DP-SINK, since the speaker acts as SINK. When a user says, "Alexa, connect to Bluetooth" the profile is A2DP, since the device can connect as SOURCE or SINK. When a client successfully establishes a connection with the specified device, the ConnectByProfileSucceeded event must be sent to AVS. If the client fails to establish a connection with the specified device, it must send ConnectByProfileFailed. This event must be sent when a client establishes a connection with a paired Bluetooth device using the profile provided in the ConnectByProfile directive. This event must be sent when the attempt to connect to a paired Bluetooth device using the profile provided in the ConnectByProfile directive fails. This directive instructs a client to disconnect from a specified Bluetooth device. When a client successfully disconnects from a specified Bluetooth device, the DisconnectDeviceSucceeded event must be sent. If the client fails to establish a connection with the specified device, it must send DisconnectDeviceFailed. This event must be sent after receiving a DisconnectDevice directive, when a client successfully disconnects from a paired Bluetooth device. This event must be sent after receiving a DisconnectDevice directive, when a client fails to disconnect from a paired Bluetooth device. These events are sent to notify Alexa that Bluetooth streaming has started or ended. INACTIVE This is the initial streaming state after connecting to a Bluetooth device, but before any content has been streamed. ACTIVE This is the streaming state while audio is streamed to/from a connected Bluetooth device. This event is sent to Alexa when Bluetooth streaming state of a connected device changes from ACTIVE to PAUSED. Media control directives in the Bluetooth interface are used to manage and control playback of content originating from a connected Bluetooth device with its profile set as A2DP-SOURCE. It is the responsibility of your AVS client to pass these commands to the connected device over the Bluetooth channel. This directive instructs the connected Bluetooth device, with its profile set as A2DP-SOURCE, to initiate playback on the A2DP sink device. When the directive is successfully processed, the MediaControlPlaySucceeded. If the client fails to process the directive, it must send MediaControlPlayFailed. This event must be sent when the Play directive is successfully handled by the A2DP source. This event must be sent when the A2DP source fails to handle the Play directive. This directive instructs the A2DP source to stop playback on the connected A2DP sink device. When the directive is successfully processed, the MediaControlStopSucceeded must be sent. If the client fails to process the directive, MediaControlStopFailed must be sent. This event must be sent when the Stop directive is successfully handled by the A2DP source. This event must be sent when the A2DP source fails to handle the Stop directive. This directive instructs the A2DP source to skip to the next media item on the connected A2DP sink device. When the directive is successfully processed, the MediaControlNextSucceeded is sent. If the client fails to process the directive, MediaControlNextFailed must be sent. This event must be sent when the Next directive is successfully handled by the A2DP source. This event must be sent if the A2DP source fails to handle the Stop directive. This directive instructs the A2DP source to skip to the previous media item on the connected A2DP sink device. When the directive is successfully processed, the MediaControlPreviousSucceeded. If the client fails to process the directive, it must send MediaControlPreviousFailed. This event must be sent when the Previous directive is successfully handled by the A2DP source. This event must be sent if the A2DP source fails to handle the Previous directive.